I must be officially crazy! Yup, I acquired this chair from a neighbor down the street, who was just throwing it out. 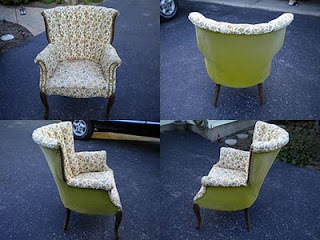 I saw the potential -but do I have what it takes to reupholster the chair the way I'm envisioning? Guess, we'll have to wait and see. Although I do have fear...I've had the chair now oh probably a month and a half and haven't touched it. Keep looking at in the garage but haven't touched it. But, I at least have inspiration. The inspiration comes from a pattern in curtains that I have in one room of my house. Although I don't have a picture (yet) of the curtains in my room, here they are: I have just the valance at the moment and my walls were just freshly painted (picture coming soon). My plan was to reupholster the chair in the same material. I'm sure you'll do fine. I once got an old table which had been painted with oil based paint. Oy. Took me weeks to strip it. Table $20. Stripper solution $100! I've heard oil based paint is terrible to redo. I once re-stained a dresser that was at my grandmothers house. It was definately a chore (strip, sand, fix problem areas, restain, varnish) but well worth it in the end. Will have to try to remember to picture it and post on the blog. OMGosh - what a great find! It has wonderful structure! Can't wait to see what you do with it!